If you experience a malfunctioning of your garage door opener, it’s frustrating. Luckily, those openers from LiftMaster, Chamberlain and Craftsman manufactured after 2012 can help you pinpoint the problem using flashing indicator lights. These more recent openers come with the Security+ 2.0 system and MyQTM technology. To make sure this is what you have, there is a yellow LEARN button on the back or side of the motor housing. To purchase or to repair your garage door system, contact us! We will provide you a free quotation before to take any decision. 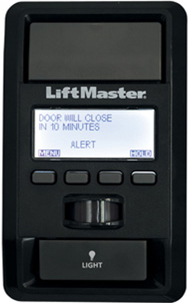 These door openers also come with the 880LM wall control panel with a large, easy-to-read, multipurpose screen. Most of the abnormal situations shown in the following table are related to the photo-eye reversal system. Either the photo eye units have gone out of alignment from an inadvertent knock, or the wires connecting the motor or the units were cut or poorly installed. On the rear of the motor housing, there are indicator arrows, one pointing up and the other down. Count the number times these arrows blink and refer to the following table. This will help you identify the cause and make the necessary corrections. The opener does not close and lights are flashing. Photocells (safety sensors) are not installed, connected or wires may be cut. Inspect sensor wires to see if they are disconnected or cut. 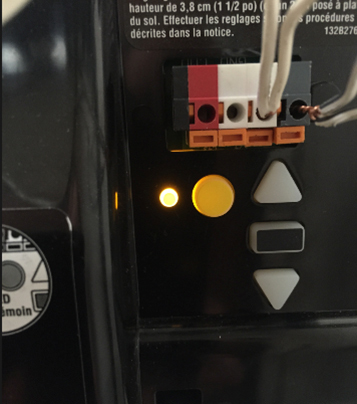 The opener does not close and the main LED light is flashing. One photocell wire is cut or wires are reversed. Inspect them and correct if needed. The door control does not work. Check the door control wires for a short or a reversed wire. Also, inspect photocell wires at all staple points and connection points. Replace or correct as needed. The opener does not close and the main lights are flashing. Photocells are misaligned or obstructed. Realign sensor boxes and so that the LED lights are steady and not flashing. If there’s an obstruction in the sensors’ path, clear it. The garage door moves 6 – 8 inches stops and reverses. Open and close the door manually. Check for binding or obstructions. Check also wiring connections at the travel module and at the logic board. No movement, only a single click. Open and close the door manually. Check for binding or obstructions. Replace logic board if necessary. The opener hums for 1 to 2 seconds without any movement. Open and close the door manually. Check for binding or obstructions. Contact a garage door specialist. The door slides after it has come to a complete stop. Program the travel to the right position or balance the garage door. No movement or no sound. The logic board must be replaced. Unable to set or keep the settings. Check the travel module for a proper assembly. Replace if needed. The battery status LED is constantly flashing. Battery backup charging has a circuit error. If it’s so, change the battery. The door is moving, stops and / or reverses for no apparent reason. Open and close the door manually. Check for binding or obstructions. If the door is not binding or sticking, reprogram the travel. The garage door moves approx. 6 – 8 inches, while opening or closing, stops and reverses. There’s a communication error on the travel module. Check the travel module connections. Replace the module if it’s necessary. The opener does not close and light bulbs flash. Photocell (safety beams) are misaligned or obstructed. Realign sensor boxes and so that the LED lights are steady and not flashing. If there’s an obstruction in the sensors’ path, clear it. 1 1 The opener does not close and lights are flashing. Photocells (safety sensors) are not installed, connected or wires may be cut. Inspect sensor wires to see if they are disconnected or cut. 1 2 The opener does not close and the main LED light is flashing. One photocell wire is cut or wires are reversed. Inspect them and correct if needed. 1 3 The door control does not work. Check the door control wires for a short or a reversed wire. Also, inspect photocell wires at all staple points and connection points. Replace or correct as needed. 1 4 The opener does not close and the main lights are flashing. Photocells are misaligned or obstructed. Realign sensor boxes and so that the LED lights are steady and not flashing. If there’s an obstruction in the sensors’ path, clear it. 1 5 The garage door moves 6 – 8 inches stops and reverses. Open and close the door manually. Check for binding or obstructions. Check also wiring connections at the travel module and at the logic board. 1 5 No movement, only a single click. Open and close the door manually. Check for binding or obstructions. Replace logic board if necessary. 1 5 The opener hums for 1 to 2 seconds without any movement. Open and close the door manually. Check for binding or obstructions. Contact a garage door specialist. 1 6 The door slides after it has come to a complete stop. Program the travel to the right position or balance the garage door. 2 1 to 5 No movement or no sound. The logic board must be replaced. 3 2 Unable to set or keep the settings. Check the travel module for a proper assembly. Replace if needed. 3 3 The battery status LED is constantly flashing. Battery backup charging has a circuit error. If it’s so, change the battery. 4 1 to 4 The door is moving, stops and / or reverses for no apparent reason. Open and close the door manually. Check for binding or obstructions. If the door is not binding or sticking, reprogram the travel. 4 5 The garage door moves approx. 6 – 8 inches, while opening or closing, stops and reverses. There’s a communication error on the travel module. Check the travel module connections. Replace the module if it’s necessary. 4 6 The opener does not close and light bulbs flash. Photocell (safety beams) are misaligned or obstructed. Realign sensor boxes and so that the LED lights are steady and not flashing. If there’s an obstruction in the sensors’ path, clear it.